The Bible’s yearly calendar of feasts is based in agriculture and Israel was an agrarian culture. The Feasts are also agriculture-based. Salvation itself is awarded to those spiritually called firstfruits. They will be resurrected first in a harvest of faithful ones to serve in His coming Kingdom. “These were redeemed from among men, being the firstfruits unto Elohim and to the Lamb,” Revelation 14:4. The importance of firstfruits in the biblical calendar cannot be over-stated. The series of seven annual Feasts begins with the month Abib, a name describing the first green grains of ripening, firstfruits barley. In the Hebrew Scriptures it is designated “the Abib” (haAbib), a definitive term for a specific stage of barley growth. It was in the new-year month of Abib when Israel kept the Passover just before coming out of Egypt, Deuteronomy 16:1. All the annual feasts are set by the critical first month of Abib, the month of green barley ears, Exodus 12:2. To establish Abib as the first month we must find the ripening firstfruits of barley grain. This beautiful harvest calendar is a lesson for in faithful obedience and reliance on Yahweh’s mercy and blessings and not fixed, calculated dates for personal convenience. Calendars are as common as wristwatches and you probably see at least one every day. Odds are, the calendar you see is the Gregorian calendar, named for Pope Gregory XIII, who updated the earlier Julian version in 1582 to align it more closely with the spring season. Gregory added rules for leap years, which insert an extra day in February. His rules have kept this calendar synchronized with the solar year to within one day in over 3,300 years. Other calendars are in use today as well. Two of these are very important to those who observe biblical feast days. The Bible specifies exactly which days of the year the feasts are to be observed – and it does not use the Gregorian calendar. Without a proper calendar keyed to the Bible it is impossible to observe the feast days on the correct days of the year, and the Bible stresses that having the correct days is very important for proper worship. This study examines the original calendar of the Scriptures (the biblical calendar), and the modified calendar derived from it (the calculated Jewish calendar). We will actually address three calendars: the biblical calendar (based on natural observations), today’s Jewish calendar (based on calculations), and the transition between these two – a calendar that started with observations, began supplementing them with calculations, and after 2,000 years finally metamorphosed into today’s Jewish calendar. Of all calendars, the true biblical calendar is one of the easiest to understand and the one True Worshipers follow today in observing scriptural days. It is so logical that any rational person can easily comprehend its structure. It requires no complicated calculations or arbitrary rules to keep it aligned with the seasons of the year. It is a lunisolar calendar, which means that both moon and sun play a part in its construction. The rules for that construction come entirely from the Bible and are so simple that after reading them for yourself you should be able to understand and explain them to anyone. Without an accurate understanding of His biblical calendar, Yahweh’s people would be unable to obey Him. Yahweh told His people they were to assemble at certain times of the year to observe His Feast days, and He did not mention “April” or “October” or any of our other Gregorian calendar months. He used words like “the tenth day of the first month” and “the first day of the seventh month” to pin down Feast day observances (moedim in Hebrew). He says, “But the man that is clean, and is not in a journey, and forbears to keep the Passover, even the same soul shall be cut off from among his people: because he brought not the offering of Yahweh in his appointed time, that man shall bear his sin” (Num. 9:13). We learn that Yahweh instructs us to observe all His feast days at precise times (Lev. 23:2), not holidays of our making at times we choose. We sin if we don’t observe them at the commanded day and time. If True Worship means keeping Yahweh’s commands, how do we determine when the fifteenth day of the seventh month is (Feast of Tabernacles)? There are varied arguments among various Feast keepers about the correct day for Passover and Pentecost, and it is certainly prudent to prove what is right (as any good Berean would), rather than blindly accept the opinions of others. How Would YOU Create a Calendar? One evening and one morning equal one day. Why did Yahweh start His day at the “end” of it? We are so accustomed to starting our days at midnight that we think it illogical to start a day at any other time. What could be more illogical than midnight? If you were living in ancient times and interested in creating your own calendar, at a time unencumbered by our modern society’s need to define and calculate everything exactly, would you not start your days at an easily observable time? What would you use as a starting point for the day? Noon is no good because it is hard to tell when noon is. Midnight is even worse. Sunrise is okay, but most people are asleep then, and even if not, determining just when the sun peeks over the horizon is much harder than determining when it drops below it because you can see it in the process of going down but not coming up. So sunset is a natural time to start, as well as end, the day. Now isn’t that a coincidence? The Bible tells us exactly that: “The evening and the morning were the first day.” In many places, including the first part of Genesis, Scripture tells us that days begin and end at sunset. Evening is metaphor for night, morning means daylight in Hebrew. How many of these days do we string together to make a week? Why do we count off seven days, then, and call them a week? The Hebrew word translated “week” is shabua, and it signifies completeness, or perfection. The week was also introduced to us early in Genesis (2:3): “And Elohim blessed the seventh day, and sanctified it: because that in it he had rested from all his work which Elohim created and made.” The word translated “rested” here is from the Hebrew root word shabath, Strong’s Concordance No. 7673 – the Sabbath. That Yahweh uses a seven-day week is clear throughout the Bible (Lev. 23:15). How many days would you put in a month? Remember, you are an ancient observer and you are observing a couple of heavenly bodies for extended periods. The sun rises and sets and the days go by. The moon is doing something a little different. It also rises and sets but the amount of it you can see varies – sometimes it is not visible at all. But it does follow a cycle. You notice over time that the moon starts as a very thin crescent on one side, gets fuller and brighter, then recedes to a very thin crescent on the other side. Then it disappears for a little while, only to repeat these phases. You count the number of days from one point to the next identical point and you notice there are about 29½ days for the moon’s cycle to complete itself. But when do you start your moon cycle count? You conclude that starting with the first crescent sighting makes the most sense and sidesteps unnecessary calculations. You decide to use this moon cycle for your calendar because just marking off solar days one at a time doesn’t seem to be of much practical use. You also notice something interesting from watching the moon. 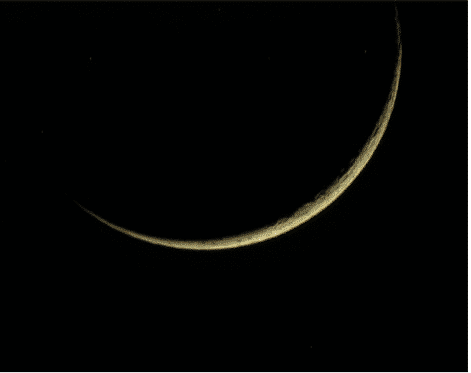 From the time you can just barely see the new crescent until the moon is at its brightest (full moon) takes 14 days. Each quarter (first, second, third, fourth) marks a seven-day period. You decide this is handy – you can count days in a package of seven by looking closely at the moon. Surprise! That’s the way Yahweh created it! As you observe about a dozen moon cycles, you notice that the sun seems to be moving along the horizon at its setting time, going from south to north and back to south. As soon as you realize this, you pick out an object on the horizon near the setting sun, and in a few days you begin to get an idea about how fast it is moving away from your object. Over time you also notice the world around you is getting warmer, then cooler, then warmer again. You count the days from the sun’s position at your marker object until it returns there, going in the same direction. Your count is 365 days. This number, representing the cycle of the sun, and the number representing the cycle of the moon (29½), are not evenly divisible. A little basic math tells you a solar year will not exactly equal 12 lunar months. The difference between 12 months of 29½ days (354 days) and the length of a solar year (365) will cause the four seasons to move around through the year. This may be of no importance to you whatsoever – why should you mind if spring comes in the first month or the second month or the third month? But Yahweh minds. Yahweh told Moses in Genesis 12:2, “This month (Abib) shall be unto you the beginning of months: it shall be the first month of the year to you.” Abib is the Hebrew name for this month, and it means “green ears” of grain. It is the month in which green ears of grain appear. But which grain? Turn to Exodus 9, where we read of one of the plagues Yahweh visited upon Pharaoh. “And Moses stretched forth his rod toward heaven: and Yahweh sent thunder and hail, and the fire ran along upon the ground; and Yahweh rained hail upon the land of Egypt. … And the hail smote throughout all the land of Egypt all that was in the field, both man and beast; and the hail smote every herb of the field, and brake every tree of the field…And the flax and the barley was smitten: for the barley was in the ear, and the flax was bolled. But the wheat and the rie were not smitten: for they were not grown up” (vv. 23, 25, 31-32). The grain that Abib refers to is barley, the one crop already “in the ear,” and the month in which the first Passover took place is Abib, the green ears of barley month. The month of Abib and the state of barley are tied closely together. If barley is not in the proper stage at that month, that month cannot be Abib. Turn to Leviticus 23. Here Yahweh explains the concept of firstfruits to the Israelites, and tells us what shape barley must be in during the month of Abib: “And you shall eat neither bread, nor parched corn, nor green ears, until the selfsame day that ye have brought an offering unto your Elohim: it shall be a statute forever throughout your generations in all your dwellings” (Lev. 23:14). The Israelites were not permitted to harvest their crops of barley until the firstfruit sheaf was waved before Yahweh by the priest. Barley is planted in November and takes about four months to mature. It must be in the green ear stage during the first month, and at least some of it ready for harvest by the time of the wave sheaf offering that occurs during the Feast of Unleavened Bread. We know it occurs during the Feast of Unleavened Bread because these verses explain how to count forward from the wave sheaf to the Feast of Weeks. Yahweh keeps the seasons aligned with the months by having us observe the maturing barley. 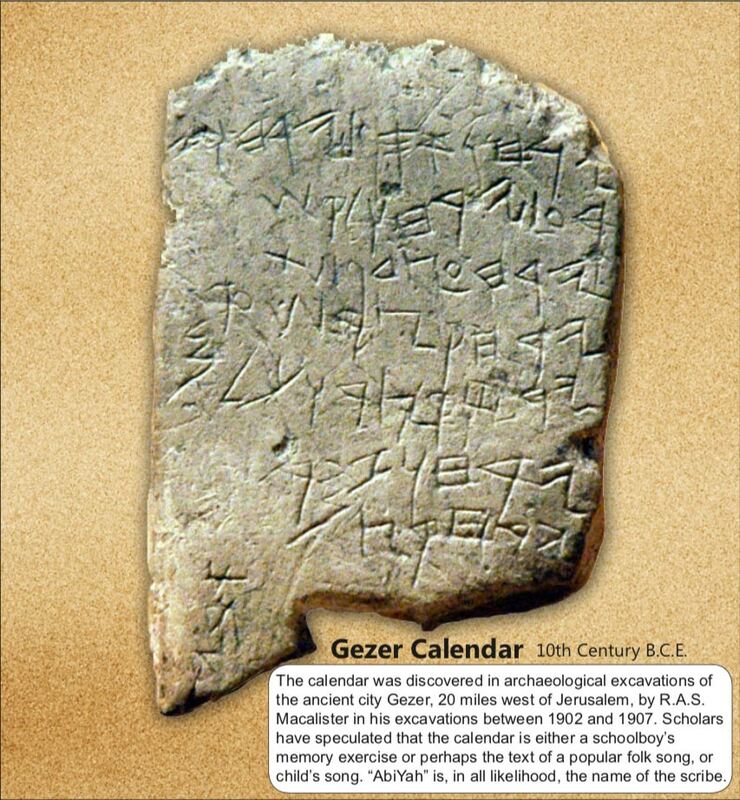 An interesting find in Israel called the “Gezer” calendar shows that the Israelites were an agrarian society that based its months from agriculture. This calendar lays out the fundamental importance of the agricultural cycle in King Solomon’s day, this can be seen in the temple festivals of Shavuot (“Feast of weeks”) or First Fruits in early summer (the “month of summer” fruit in line 8), and the Feast of Ingathering (the harvest) in the fall which culminates to the Feast of Tabernacles. The mention of feasting reflects the pilgrimages festivals which involved feasting. 1. Start and end days at sunset (Genesis 1:5). 2. Start weeks at day one and end on day seven, the Sabbath (Leviticus 23:15-16). 3. Start months with the sighting of the new moon (Deuteronomy 16:1). 4. Start years in the month barley will be harvestable by the middle of that month (Leviticus 23:4-14). These rules require you to observe Yahweh’s creation – sighting a sunset or a new moon and looking at a barley crop. Psalm 33:8 says, “Let all the earth fear Yahweh: let all the inhabitants of the world stand in awe of him.” Is there a better way than to get outside and look at some of these awesome, timekeeping sights of creation? That the biblical calendar given by Yahweh was with us from creation seems logical, but Yahweh’s revelation of it to Moses took place just before the exodus, about 3,500 years ago, as Yahweh explained the Passover, its significance and timing. In the first five books of the Bible, the Torah (all written by Moses), the rules for the “original” biblical calendar were given by Yahweh to the people of Israel by oral and (later) written instructions. Today’s modified Jewish calendar, however, is one of the more difficult to comprehend. It has added and revised rules that move dates without biblical authorization. 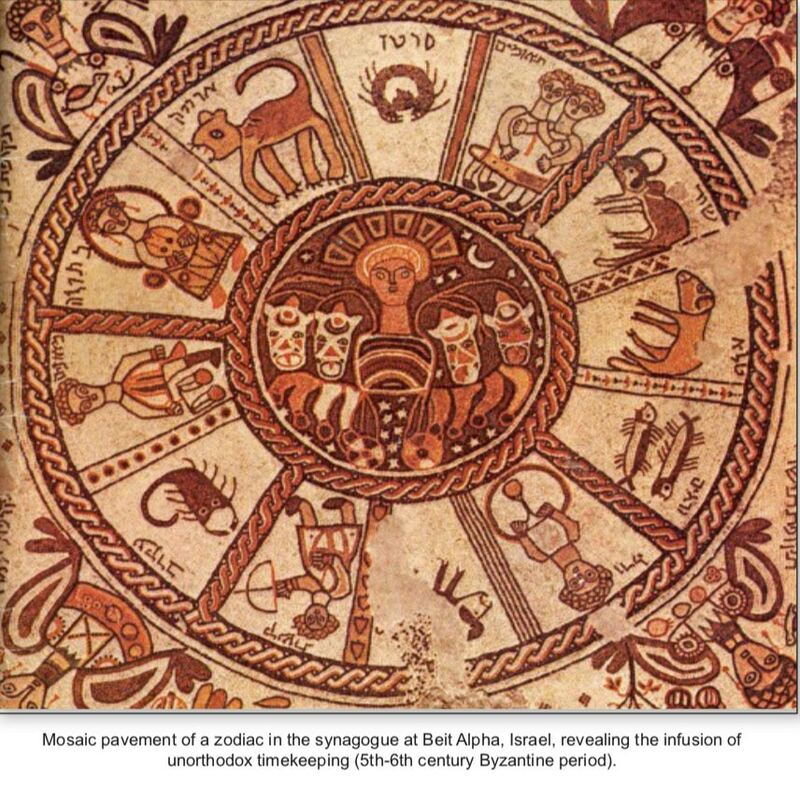 The original Hebrew calendar was the biblical calendar of the exodus. For over 40 years in their journey from Egypt to the Jordan River crossing the Israelites in the desert determined their years exactly in accord with the four rules declared by Yahweh through Moses. What happened from then until now? To answer that we will need to consult non-biblical sources. Be careful! Unlike the rock-solid Word, there are many sources of “fact” written by men, and where there is man-made “fact” there is man-made counter-fact. The Talmud is a combination of fact, teachings, traditions, analyses, ideas, opinions, and in some cases outright prejudice – which are considered “facts” by many Jews today. During the Talmudic period, observation of the moon and crops evolved toward calculation. First, the Israelites would have noticed that the new moon appeared either every 29 or 30 days – never shorter, never longer. Simple counting, then, gave them the ability to anticipate the actual observation. After settling in the Promised Land they would have noticed something about the year, also. The maturation of their crops of barley could be correlated with the position of the setting sun on the horizon. The seasons are very important to agrarian peoples. Knowing proper planting times is crucial to survival, and fixing the beginning of a season, particularly spring, is advantageous. Yahweh decreed that the year was to begin in the month when barley would be ready for harvest. The Israelites quickly noticed this happened very near or in the spring season, and that the beginning of spring could be determined from the sun’s setting position on the horizon. Over time the observation of the sun’s position replaced the observation of barley. 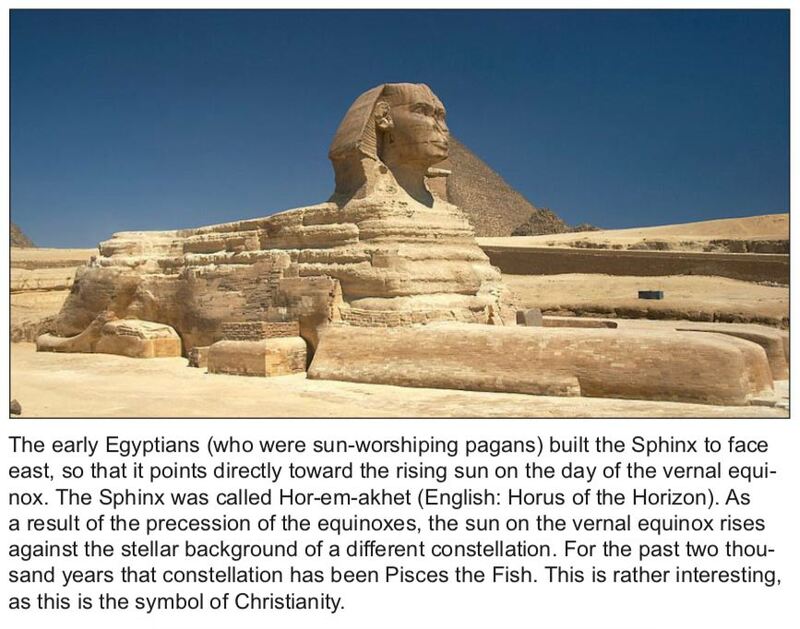 The pagan Egyptians and later the Romans also observed a solar calendar. Beginning with their possession of the Promised Land, the Israelites became more scattered and communications with Jerusalem’s priests (who observed moons and waved grains) became increasingly difficult. 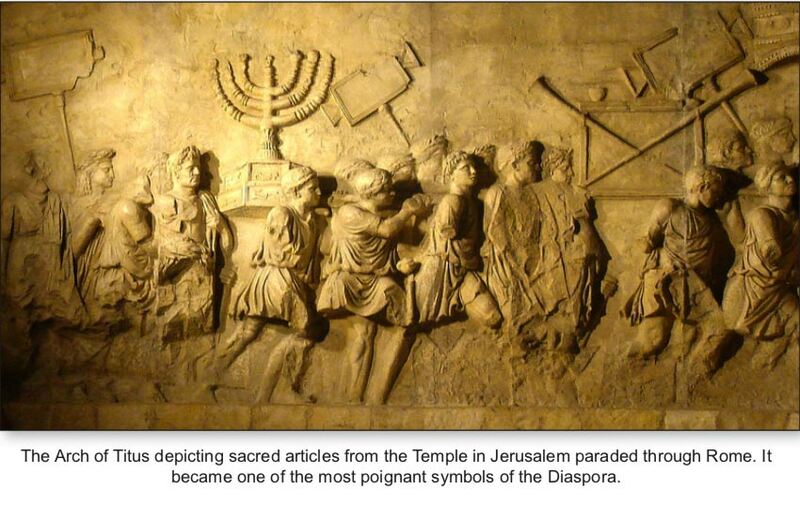 Later, the Israelites of the Dispersion generally took up the civil calendars of their conquering countries and were informed by messengers from Jerusalem of coming feasts. Certainly by the end of the Talmudic period, and most probably hundreds of years before, the Jews had accumulated sufficient knowledge to convert a calendar based on observation to one based on calculation alone. According to the Apostle John, Yahshua’s Passover meal was eaten the night before the Passover meal was eaten by His Jewish accusers – this indicates that two ways of determining dates existed at the time of the impalement. That the new moon of Abib could have appeared on two different days is, of course, impossible. In any case, the separation of Israel’s peoples made it increasingly difficult for those not residing in the Holy Land to stay in synchronization with their brothers. Indeed, after the failed Bar Kochba revolt in 132-135 CE the Sanhedrin – the post-exile Jewish supreme council – was barred from meeting. Something had to be done to preserve holy day observance, and about 359 CE patriarch Hillel II revealed a method of Jewish calendar calculation that contained many elements obviously learned from places like Babylon. According to Hillel, and to the many Jews and others who believe that the methods of calculating this calendar were divinely presented to the Israelites, this calendar was in place from the very creation. • A month is determined by the calculation of the conjunction of the moon (Hebrew molad, a point in the moon’s orbit exactly between the earth and the sun – and invisible to us), not new moon sighting; hours are added to the molad to determine when the new moon should or should not be visible. • The first molad occurred 5 hours and 204 chalokim (3 1/3 seconds) after sunset at the beginning of day 2. • Every molad is calculated from this point by adding 29 days, 12 hours, and 793 chalokim. • A nineteen-year cycle of months of 29 and 30 days is employed, together with leap months inserted in seven of the years, to keep the seasons in line with the solar year; the cycle consists of regular and leap years as follows: R-R-L-R-R-L-R-R-L-R-L-R-R-L-R-R-L-R-L.
• The cycle is not exactly the length of nineteen solar years – it is a little over 2 hours longer; every 216 years this adds up to a whole day, and there are no corrections in the calculations to prevent spring from moving away from Abib; if the calculated Jewish calendar had existed at the beginning, this error would have already moved the seasons 26 days away from Abib – one entire month. • The year begins with the seventh month (Ethanim), not Abib; the first day of Ethanim is Rosh Hashanah. • Postponement rules for Rosh Hashanah are required such that an annual Sabbath is never juxtaposed with a weekly Sabbath (prevents two consecutive non-work days); these rules are not simple – here is one of them: if the molad of a year following a leap year which begins on Tuesday is later than Monday, 15 hours and 589 chalokim, Rosh Hashanah of the second year is postponed from Monday to Tuesday. • The calculated molad can sometimes start a month before the new moon is visible, and the postponements can actually cause a month to begin the day after the new moon is sighted. • The entire calendar, from the beginning to any point in the future, is fixed by its starting point, the length of a molad, and the postponement rules; no observation is necessary. All these rules and calculations keep the seasons and the solar year rather closely aligned, without a single observation of a new moon or a series of sunsets. They are very handy for Jews but not a single bulleted item we’ve noted is mentioned in the Bible, and using this calendar means you will be celebrating feast days at times different from those the biblical calendar specifies. Did the perversion of the biblical calendar start in Talmudic days, or was it later, around Hillel’s time? Yahweh confirmed the importance of the biblical calendar at the beginning of the Exodus (Lev. 23), and that is the time Satan began his work to pervert it. Isn’t it amazing how Satan has twisted everything in the Bible to his advantage? Yahweh gave us laws to live by while Satan tells us they are just for ancient Israelites. Because His Feast days are important to Yahweh’s plan for mankind, Satan replaces them with those important to his plan. He also derails Yahweh’s inspired calendar by man-made calendars. If we must have a Messiah to be saved from sin’s death penalty, then the adversary causes churchianity to refute Him by convincing them to celebrate Easter! They take the very first inspired time of the sacred year and celebrate it with sunrise services, egg-laying rabbits, and leavened hot-cross buns. To top it off, Satan puts it on the wrong day. For those who escape this trap, he lays another one. When Numbers 9 says observing Passover on a particular day and at a particular time is very important, Satan confuses time itself. If the bulleted items on pages 12-13 seem a bit convoluted and confusing compared to the four rules Yahweh originally gave the Israelites, it is because they are. Whenever Satan works, things always get complicated. Why Not Use the Vernal Equinox to Start the Year? Some ignore barley altogether and set Abib 1 according to the vernal equinox. The vernal equinox is that instant when the sun is directly above the earth’s equator while going from the south to the north (for inhabitants of the northern hemisphere). It is the time that most consider the beginning of spring. Those who employ the vernal equinox point to Genesis 1:14, claiming that the sun, moon, and stars set the year’s beginning. It is true that the sun divides day from night and inaugurates the seasons by the earth’s tilt, while the new moon sets the beginning of months. Yet, nowhere in the entire Bible can one find that the vernal equinox establishes the first month Abib. Nowhere in the Bible is there even any mention of the vernal equinox. To say that Genesis 1:14 refers to the vernal equinox is reading into Scripture what simply isn’t there. Passover is related to spring through the growing cycle of crops. First and foremost, it must occur in the month of Abib. And Abib is a condition of grain as much as it is a time of the year. The King James Version has led some astray in the way it translates moed in Exodus 13:10, Num. 9:2, 3, 7, and 13. The KJV uses “season” in these verses, causing some to believe that the command is specifically for springtime, and therefore must involve the vernal equinox. In reality, the Hebrew moed simply means “set time” or “appointed time.” Yahweh has set Passover and the Feast of Unleavened Bread by the criteria of ripening crops, not by the vernal equinox. The vast majority of Jews gradually got away from actively looking for the green ears of barley, going instead by a calculated calendar that involved the vernal equinox. This was done for the sake of convenience. But Yahweh tells us that His growing cycle reveals the proper month for His Feasts. The first month of the year, Abib, means a green ear (of grain), not vernal equinox. McClintock and Strong’s Cyclopedia of Biblical Theological and Ecclesiastical Literature, Vol. 3, p. 13, under Easter states: “Many of the Church fathers are of opinion that, according to the original calculation of the Jews up to the time of the destruction of Jerusalem, the 14th of Nisan had always been after the spring equinox, and that it was only in consequence of a miscalculation of the later Jews that the 14th of Nisan occasionally fell before the equinox. They therefore insisted that the 14th of Nisan, which for both parties within the church determined the time of Easter, should always be after the equinox. Note that the Christian “Church fathers” established their own rules by relying upon the vernal equinox as did the pagans, instead of the green ears of barley as the Bible requires (Deut. 16:1). Another authority writes, “That the vernal equinox occurred in Nisan [Abib] is attested by Josephus (Ant. 1. x. 5) and also in cuneiform literature (Muss-Arnolt p. 77) Nisan corresponded to the first zodiacal sign (Aries) in which the vernal equinox fell. The sacred year was determined by the annual festivals and the first of these festivals was henceforth fixed by the Passover moon.” “Equinox and the Calendar,” Dictionary of the Bible, James Hastings, p. 765. Nothing is mentioned here about letting the equinox determine the month of Nisan. The vernal equinox fell within the month of Nisan [Abib] which means the new moon of Nisan came BEFORE the equinox. That is, the new moon came establishing the month of Nisan (Abib), then came the equinox, then the Passover. Therefore, those who insist upon keeping the Feasts a month later are out of harmony with Yahweh’s calendar. Fausset’s Bible Encyclopedia, under “Year [Hebrew year] reads, “They began it with the new moon nearest to the equinox, yet late enough to allow of the firstfruits of barley harvest being offered about the middle of the first month. So Josephus (Ant. iii. 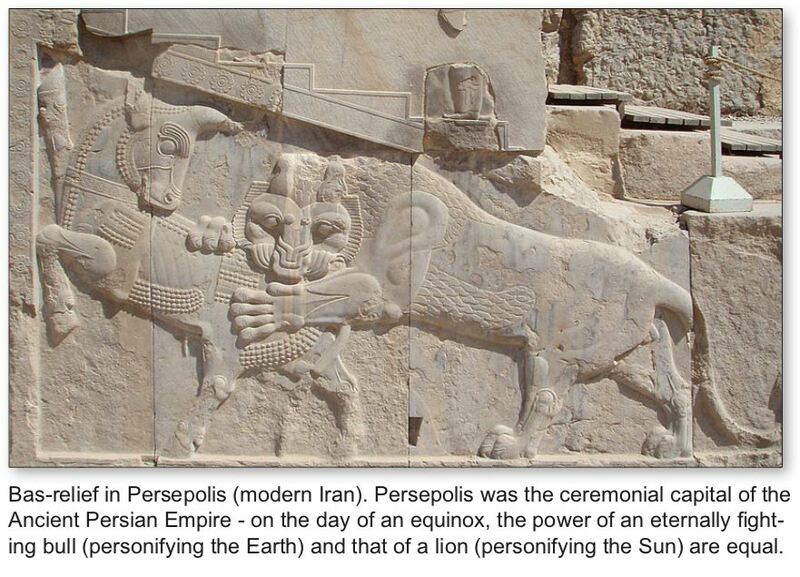 10,5) states that the Passover was celebrated when the sun was in Aries” (p. 727). When the Roman church deliberately acted to separate Easter from Passover, it ruled in 325 CE in the Council of Nicaea that Easter would fall on the first Sunday after the first full moon following the vernal equinox. This setting of an observance was entirely man-made, and it is appropriate that it applied to a man-made holiday called Easter. The Roman church on its own volition, therefore, bestowed a legitimacy on the vernal equinox as a calendar marker where it had none before – at least not in any kind of biblical context. • “Easter, too, celebrates the victory of a god of light (J-sus) over darkness (death), so it makes sense to place it at this season. Ironically, the name ‘Easter’ was taken from the name of a Teutonic lunar goddess Eostre (from whence we also get the name of the female hormone, estrogen). Her chief symbols were the bunny (both for fertility and because her worshipers saw a hare in the full moon) and the egg (symbolic of the cosmic egg of creation), images which Christians have been hard pressed to explain. Her holiday, the Eostara, was held on the Vernal Equinox Full Moon. Needless to say, the old and accepted folk name for the Vernal Equinox is ‘Lady Day.’ Christians sometimes insist that the title is in honor of Mary and her Annunciation, but Pagans will smile knowingly.” – Lady Day: The Vernal Equinox, by Mike Nichols. • “The vernal equinox has long been a significant event in the lives of agricultural peoples as it symbolizes nature’s regeneration, fertility, growth and bounty. The word equinox comes from Latin and means ‘equal night’ (Tag- und Nachtgleiche). On this day, night and day each last twelve hours. The Vernal Equinox used to be considered the beginning of the Pagan New Year. It was a time of joy called forth by the resurrection of the ‘Light of the World’ (sun god) from the underworld of the winter, from where he arose to join his goddess Eostre.” – by Ruth Reichmann, Max Kade German-American Center, Indiana University-Purdue University, Indianapolis. • “Modern Pagans also celebrate the universal principle of Resurrection at the Equinox – which is named for Eostre, a Pagan goddess. She is the goddess of Spring to whom the offerings of cake and colored eggs were made at the Vernal Equinox. Rabbits, especially white ones, were sacred to her, and she was believed to take the form of a rabbit. She is also said to be the goddess of the East, that being the direction of rebirth. Since the sun rises in the East, she is linked with the sunrise. Traditional Easter services stem from this association,” Ibid. “Easter is supposed to be derived from Anglo Saxon Eostre, the name of the Norse goddess whose festival is celebrated by the pagans at the vernal equinox.” – A Book About the Bible, George Stimpson, p. 180. • “Pagans revere the G-d and G-ddess through rituals or ceremonies of various kinds. Pagans of the western traditions celebrate eight festivals or Sabbats each year. They comprise the four solar quarters i.e. the two solstices (longest and shortest days) and the two equinoxes (day and night are the same length) plus four Celtic seasonal festivals. All these mark important events in the cycle of life. They are: Ostara (Easter), the spring equinox, 21st March: Return of the sun from the south, springtime proper. Some celebrate a holy union between G-d and G-ddess.” – from What Do Pagans Do? Vernal Equinox as the ‘Tequphah’? The argument has been attempted that the vernal equinox corresponds to the Hebrew word “tequphah,” which is found several times in the Bible. The definition of tequphah (Strong’s Concordance No. 8622) is: “A revolution, i.e. of the sun course (of time) lapse: circuit, come about, end.” From the definition, we find it next to impossible to attach any firm connection of tequphah to a spring equinox. The evidence, in fact, points to the end of the year, not the beginning. Brown, Driver, Briggs Hebrew and English Lexicon defines the tequphah (Strong’s No. 8622) as: “coming round, circuit;–Ex. 34:22, adv., at the circuit (completion) of the year, so 2Chron. 24:23= pl. cstr. 1Sam. 1:20; sig. Sf. Of finished circuit of sun.” p. 880. This source says about the root of tequphah: No. 5362 naqaph: 1. An intransitive verb meaning to surround something… (Isa. 29:1, let feasts go around, i.e. run the round (of the year). 2. make the round, i.e. complete the circuit. Job 1:5 when the days of feasting had completed their circuit. The closest we have in the Hebrew to spring as a season is 6779, tsamach, a primitive root meaning to sprout, bear, bring forth, bud, grow, cause to spring (forth, up). Yahweh again reveals that the time for His Feasts is based on the growing of crops, not to the vernal equinox. Ancient Israelites were farmers and herders, not astronomers. It stands to reason that Yahweh would zero in on their crops as a starting point for their annual Feast calendar. 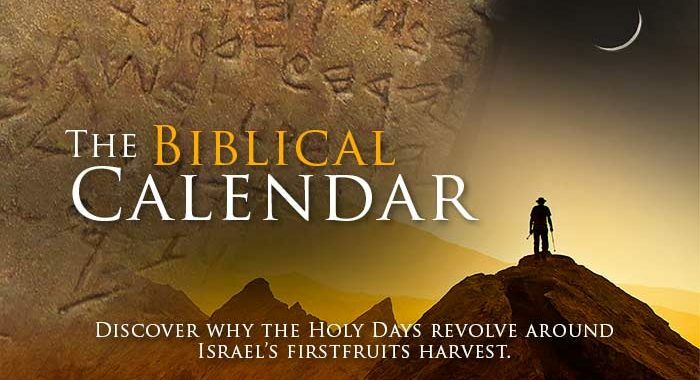 The calculated calendar does not work with the command to give Yahweh the firstfruits. Let’s sum up the differences between what Yahweh said about keeping time and what the Jews of today do with the calculated Jewish calendar. • Yahweh said begin the year with Abib when crops are green and growing. Jews begin with Ethanim in the autumn. • Yahweh said begin Abib by checking the barley crop. Jews check the date of the vernal equinox and add hours. • Yahweh said begin months by sighting the crescent moon. Jews calculate from a molad (invisible conjunction). • Yahweh said nothing about not putting two Sabbaths back-to-back. Jews create postponement rules. • The rules laid down by Yahweh automatically adjust for what’s going on in the solar system. any exact number of days. He said new moon to new moon was a month, Isaiah 66:23. Yahweh never said how many months were in a year, either – just that they started with new moons, Ezekiel 45:17-18. The words for “molad” or “equinox” or even spring, when used as a season, do not appear in the Bible. The critical difference between the biblical calendar and the calculated Jewish calendar is that they produce different days for observing the feasts. One is correct, the other is wrong. One obeys Yahweh, the other does not. Keeping this in mind, let’s look at the major reasons offered by some for using the calculated Jewish calendar to determine feast days and times, and their counter-arguments. • Yahweh committed the oracles to the Jews and we should follow their lead. This argument comes from the Apostle Paul’s writings to the Romans. “What advantage then hath the Jew? or what profit is there of circumcision? Much every way: chiefly, because that unto them were committed the oracles of Yahweh” (Romans 3:1-2). What were the “oracles”? The proponents of the calculated Jewish calendar include the rules for calendar-making in these oracles – but that logic could include anything they added, including the Talmud. In Acts 7:38 the same Greek word for “oracles” is used – (No. 3051), where it says, “This is he (Moses), that was in the church in the wilderness with the angel which spake to him in the mount Sina, and with our fathers: who received the lively oracles to give unto us.” Here oracles refers to the law given Moses on Mt. Sinai. The oracles or laws were all given to all of Israel as is recorded in Deuteronomy, not just to the Levites or to any one tribe. • The scribes and Pharisees sit in Moses seat, so we must obey them. This argument comes from Yahshua’s words in Matthew 23:1-3: “Then spake Yahshua to the multitude, and to his disciples, Saying, The scribes and the Pharisees sit in Moses’ seat: All therefore whatsoever they bid you observe, that observe and do; but do not after their works: for they say, and do not.” According to Yahshua, this metaphor means they read the law to the people on the Sabbaths, just as Moses transmitted the law. Reading the law and doing what it says are two different things, as Yahshua pointed out, but this argument usually omits the part about “do not after their works: for they say, and do not.” Someone who says one thing and does another is a hypocrite. Did Yahshua follow the Pharisees’ interpretation of when the Passover should be observed (remember, they kept the Passover on the 15th)? Clearly He did not. • The Jewish calendar is a complicated calendar, and although the rules for its construction are not given in the Bible, the Levites were given these rules in order for them to relay correct dates to the people. That the calculated Jewish calendar is complicated is true. Its rules are not in the Bible, and it should not be logically concluded from this that they were given orally to the Levites. If the Levites were given the correct rules for calculating the Jewish calendar, then why do their calculation tables today use a solar year that is 365.25 days long? That figure is about eleven minutes longer than the solar year really is. Also, the 19-year cycle is longer than 19 solar years by over two hours. If Yahweh gave the Levites the rules, why did He not also tell them the correct value for the mean length of a solar year, and also give them rules to adjust the cycle to prevent future problems with the months and the seasons, like adding a periodic 13th month? Why would a perfect Creator give us imperfect rules? And why would He have told only the Levites something so important? In just about every instance, when Yahweh spoke to Moses, He started out with a phrase something like, “Say to the house of Jacob,” or “Tell the people of Israel,” or “Speak unto the children of Israel.” If you read the 23rd chapter of Leviticus, where the feast requirements are laid down, this is particularly true. There is no place in the Bible that says that Yahweh told Moses to tell the Levites to in turn tell the people something. Turn to Deuteronomy 1:3. Here, just before the people were to cross over the Jordan and into the Promised Land, Moses made his farewell speech to the Israelites. “And it came to pass in the fortieth year, in the eleventh month, on the first day of the month, that Moses spake unto the children of Israel, according unto all that Yahweh had given him in commandment unto them.” Notice that he was not talking to the Levites alone, but to all the Israelites. Also notice the word “all” in this verse. It is the Hebrew kole, Strong’s 3605, “from 3634; properly the whole; hence all, any or every (in the singular only, but often in a plural sense):—(in) all (manner, [ye]), altogether, any (manner), enough, every (one, place, thing), howsoever, as many as, [no-] thing, ought, whatsoever, (the) whole, whoso (-ever).” The root word (3634) means, “to complete, make perfect.” The verse does not say Moses withheld words for the Levites’ ears alone. In chapter 16 verse 1 of this book is the commandment for observing the moon of Abib, to keep the Passover. It is very significant that Moses gathered every tribe together and explained again everything they needed to know before possessing the land. No one tribe or person was to have this knowledge exclusively. They all started out equally in the Promised Land. They would not be able to blame any other person or tribe for their mistakes. • Not everything Yahweh taught the Levites is recorded in the Bible. It seems logical that Yahweh could have said and done things not recorded in the Bible. But is it logical that Yahweh would have omitted something so important to His worship, depending only on the instructions of a special group to relay His requirements? He never did that with any of His other instructions and commands. • Postponements are not condemned in the Bible; the calculated Jewish calendar does not violate one Scripture. In Deuteronomy Moses was making his wrap-up speech to the Israelites before they parted. Read Deuteronomy 4:2: “You shall not add unto the word which I command you, neither shall you diminish ought from it, that you may keep the commandments of Yahweh Elohim which I command you.” See also Revelation 22:18-19. If we are told not to add anything to the Word, and doing so changes the very day a Feast is observed, and as a result I am cut off from my people, it is clear I have violated something in the Scripture. • The Bible does not define what a new moon is, so we are not instructed how to watch for the new moon. This argument is made in support of substituting the astronomical conjunction for the actual sighting of the new moon. Let’s look again at Deuteronomy 16:1, paraphrased as closely to the Hebrew meanings as Strong’s dictionary allows. “Look narrowly for the new moon of the green ears of grain and keep the Passover.” Once again, Moses was speaking to all of Israel here. He told them to look for the new moon of Abib. He did not tell them to check with the Levites about molads. A molad (conjunction) as we have already learned, is when the moon is exactly between the earth and the sun. This argument substitutes the molad, a moon you cannot see, for the new moon crescent, which you can. Imagine a desert-dwelling shepherd from the tribe of Dan trying to figure out when the molad of Abib would occur! He definitely would not have “looked narrowly for” a dark moon that he could not possibly see! Saying that we were not instructed in how to look for a new moon is ridiculous. Saying we are to look for a black moon is ludicrous. To equate the words “new moon” to “molad” is even more ridiculous. If I asked you to observe my “new car,” and I pointed to an empty parking space, what would you think? Apply the same logic to the phrase “new moon” and then go out and try to spot the conjunction. It’s impossible. The biblical calendar can be projected, but it is confirmed only by observation of barley and the new moons. Just as Yahweh planned when He created the “lights” in the sky, Genesis 1:14, we are to establish His appointed times (moed) by the monthly lunar cycle and to start at that particular time of year when the sun causes barley to grow and begin to produce grain in the ear. When we follow the scriptural calendar, all the complications that calculated calendars try to overcome just disappear. And we rest assured that we are observing the days Yahweh commands – at the proper time He commands them. ← The Calendar- Equinox or Barley? Does the Bible mention the year having a 13th month? how about the green ears in the sheaf being held in the hand of the virgin in the constellation virgo? The bright star spica is rising in the east shortly after sunset in the month of aviv and leading up to it.